Unfortunately it say code Expired now :S is it only on pacific items. (lol) I like the "a style that will never date" comment ... to be fair gold is timeless ... just not sure about it on your footwear! 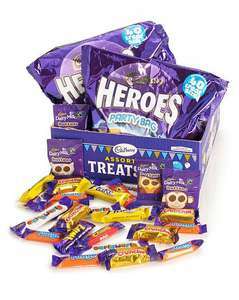 Funny how Cadbury have this hero's party bag yet their tubs of heroes don't include a crunchie etc. Is this Jacamo's tactic, selling chocolate to fatten people to buy their clothing! Same price in Curry's in blue for quicker delivery. Delivery is estimated as 18th December on original link. Gone back up to 219. £169.99 added as another deal. Poor show! yesterday a lot of these were 50% off. Was looking for a men's wallet and saw that Jacamo have an up to 70% off Autumn sale. Sales been there for about a week. If you sign up for the newsletter you'll get free shipping. Look around there might be a code for it. I haven't been so lucky. Not for me ive ordered several times and it always comes next day without fail. Good luck if you get it next day though. Have had it for almost a year and nothing has arrived the next day. When questioned they said next day "from dispatch", but dispatch can take up to 2 or 3 days. 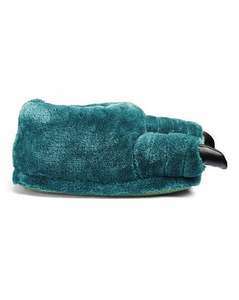 Heat...best slippers I have owned! Don’t take it personally. But I’d guess that £25 for woolly slippers, in summer, just doesn’t get the juices flowing! I'm confused. Use Hot deals all the time but don't post up deals I find. I got these and most places sell at much more. Why all the hate? Perfect for the 30C heatwave coming next week. I have a dozen or more Primark T Shirts: I wear them every day (except in this hot weather) and they are great after many years of use. No fancy labels but just decent shirts at a great price. I do choose the colours which are 100% cotton. Son has lots of premium branded T Shirts and, frankly, they are very variable and some are not good. Primark tshirts don't wash well and last 2 or 3 washes at best. I stopped shopping there a long time ago as stuff just didn't last. Bang on for kids stuff as they grow out of it so quick. Sure if you want a shirt that fits a square, is see through and looks awful on an human. Agreed. Primark stuff loses shape and quality after just a few washes but for £2 hard to complain. Each to there own tho I suppose, I’d certainly rather spend that little extra tho for a better quality top. Good price, you'd pay the same for an unbranded one from Next. Free collection in store or from a Hermes drop shop. I looked closely at the ones on TKMaxx website. To confuse things further, the black one showed a check lining but the others don't show anything. On close examination I noticed the zip on the black one was different to the others so wondered if it was perhaps a different model to all the others. I do have a TK Maxx close by so may try and pop in and have a look. Thanks for the update. Quite by chance I was passing by a TK Max store today so I popped in to see if they had any in stock and to check out the sizing. I wasn't expecting to find the one I was looking for (Navy Blue), they only had the green ones but it did have the sizes and I can confirm that the fit were true to size, medium fitted me just right. They also had the tartan lining and seemed the genuine article. The additional photos on the M&amp;M website have put some further doubt in my mind as it shows a straight seam rather than the umbrella style common to Harrington's. I haven't seen that on any of the jackets on the Ben Sherman website. Thought I'd drop you a note in case they have your colour/size available - if you have a store nearby you could order two to try, get the free delivery and return the one you don't want. I've just ordered two mediums, can't decide on the colour now so ordered a blue and stone! At least I know they will both be the right fit. I'll let you know about the M&amp;M ones, they were dispatched today. I'll have to make sure the other half doesn't find out I've ordered 4, she'll moan like hell despite the reason for me doing it! I could be wrong but unlike Docs and Fred Perry, that do both expensive English made and cheaper overseas made stuff, I think all Ben Sherman stuff is made overseas. All of mine including the one from Jacamo are made in China. As I said, I don't think you will have ordered fakes but I guess there is a chance they make 'budget' models the way Vans and other companies do to sell in their outlet stores. Fingers crossed for you though! 35" &amp; 36" inside leg jeans for £20. Not bad. Worked for me but only a £2 discount so £10 plus free shipping. Launched in 2007, Jacamo is an online retailer for men’s clothing, accessories, and footwear in large and extra-large sizes. Jacamo is part of the London Stock Exchange listed N Brown Group that owns several other high street brands such as JD Williams, High and Mighty, and Simply Be. Jacamo have physical stores in several locations across the UK including one in Liverpool, Gateshead, Manchester, Leeds, and London. To check if there’s a store near you, use Jacamo’s store finder. You can also order items over the phone by calling 0871 2312000. Of course, it’s also possible to shop for men’s clothing by visiting Jacamo’s online store at www.jacamo.co.uk. Jacamo uses a secure server to keep confidential customer details such as credit card information safe. Menswear – From blazers to trousers, underwear, and socks, this section has just about everything a man's wardrobe could ever need. Accessories – Everything a man needs to put those finishing touches to an outfit including hats, cufflinks, belts, and watches. 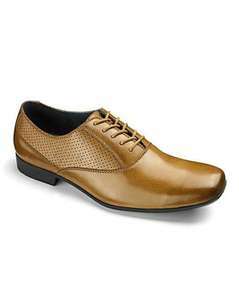 Footwear – Jacamo offers footwear for all occasions, whether formal or informal, as well as for outdoor sports such as walking. Denim Items – A specialist part of the site that focuses on denim clothing, particularly denim jeans. There are several ways to save money at Jacamo´s online shop. Firstly, it’s always worth keeping an eye on Jacamo’s current promotions on the Sale section of the website. Jacamo also have an Outlet section that has vast propositions throughout the year. Deals are also mentioned in Jacamo’s newsletter, which you can subscribe to when you create an account. As well as the January sales, Black Friday and Cyber Monday can also be good times to pick up a bargain at Jacamo. For Black Friday 2015, Jacamo offered a 20% discount on spends of £50 or more as well as free delivery. On Cyber Monday, they offered a 25% discount on spends of £40 or over with free delivery. Another good way to save money at Jacamo, particularly if it’s not Black Friday weekend, is to use a voucher code. Previous Jacamo voucher codes have offered as much as 25% off orders. hotukdeals collects all of the latest Jacamo voucher codes on a dedicated page. If it’s your first time shopping at jacamo.co.uk, you will automatically be given a discount off your order as well as free delivery. To shop at Jacamo, you will need to create an account if you don’t already have one. Having an account allows you to track your order and manage returns. It also allows you to create a wish list which allows you to browse the store and save your favourite items for viewing later. You can then compare items that you’ve saved to your wish list or purchase them at a more convenient time. Jacamo accepts the following payment methods: Visa, MasterCard, and Maestro and you can pay with either a credit or debit card. You can also set up a direct debit from the “my account” section of the website. It’s also possible to spread the payment using a payment plan, although be aware that your items will end up costing more if you shop this way. The typical APR is 58.7%. Next Day Delivery – Your order is delivered the next day (from £3.99). Nominated Delivery – This allows you to nominate a day and a timeslot for your order to arrive (from £3.99). Sunday Delivery – If you need your order for a Sunday, select this option (from £3.99). Direct Express Delivery – Direct express delivery means items are sent to you directly from the supplier. This normally takes 2-3 days (as opposed to the typical 3-5 days). Click & Collect at Jacamo stores – Get your order delivered to your nearest Jacamo store (free). Click & Collect at Hermes ParcelShop – Get your order delivered to your nearest Hermes ParcelShop (free for orders over £40). There are four ways to return an item to Jacamo. Regardless of which method you choose, you will need to complete the returns slip that came with your order. This helps Jacamo to understand why you’re returning your order and to process your refund. By Courier – To arrange collection using the courier that delivered your order to you, call 0345 0719022 and press option #1. By myHermes ParcelShop – Your order contains a myHermes ParcelShop address label. Fix the label to your order and pop it into your nearest myHermes ParcelShop. You can find your nearest one by using the store finder. By InPost 24/7 Parcel Lockers – You can return your order to an InPost parcel locker. To find your nearest InPost Parcel Locker and to download a printable label, visit this page. By Post Office – You'll find a Post Office returns label with your order. Simply attach it to your order and bring the package to your nearest Post Office. You can find your nearest Post Office with the help of the official branch finder. If you wish to order a replacement or to exchange an item, you should get in touch with Jacamo´s customer services first either by e-mailing general.enquiries@jacamo.co.uk or by phoning 0345 0719022. Jacamo also has a blog and a newsletter where their team writes about men’s fashion, discusses outfit ideas, and posts their latest discounts and special offers. Jacamo also have an FAQ section where they answer commonly asked questions about delivery, shopping online, and using voucher codes. hotukdeals collects all of the latest Jacamo deals and special offers on this dedicated page. Check back regularly for new deals and promotions for Jacamo.